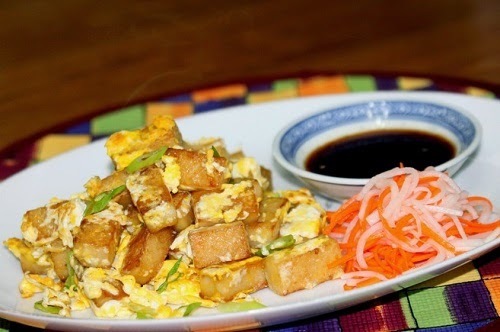 Fried Rice Cake with Egg is one of well-known Vietnamese street food and is also sold in stores Dim Sum. 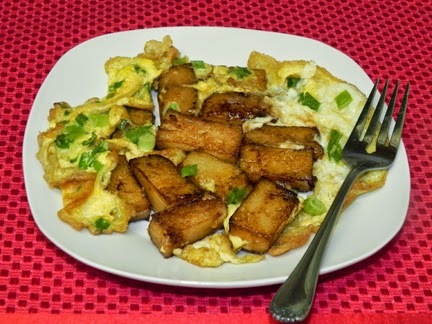 Little pieces of fried rice cake with egg made of rice flour form the base of the dish. The doughy squares, along with a generous amount of oil, turn golden and crispy on the hot skillet. 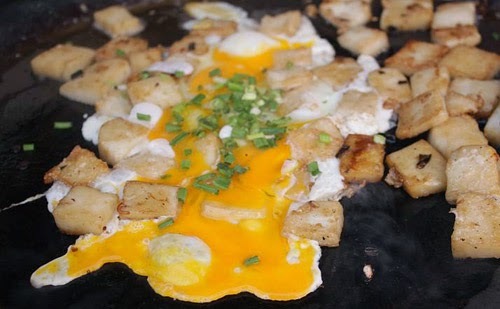 Vietnamese people are familiar with fried rice cake with egg from a long time by the vendors on the street. Each ingredient in this simple dish plays an essential part in the overall flavor. The eggs enhance the dough with texture and body. The fresh vegetables cut the dough’s oiliness. And the soy sauce provides a deep saltiness that ties all the ingredients together. In Saigon, fried rice cake with egg does not depend on the morning or afternoon, patrons of this Vietnamese street food mostly students, pupils, who like eating with the cheap price. Heat a pot of water to steam the cake. Once hot water, pour mixture in a pan and steam for 30-40 minutes until done. When insert a chopstick in and it comes out clean then it is done. Cut into 1-inch by 2-inch rectangles rice flour. Use a bit of oil to fry the rectangles on both sides until golden brown and crispy. Add 3 sliced scallions. After that, add 3 beaten eggs. Break up the egg a bit and stir-fry so the rice flour absorbs the sauce. Finally, you finished one of delicious Vietnamese street food. It’s better to serve with soy sauce and hot sauce, decorating with some scallions and papaya sliced. Plate and enjoy while crispy.